This past weekend, I participated in the Minnesota Blogger Conference. Participating in this event was so inspiring. All of the speakers were experts in their fields and the overall persona of the event was exciting. I loved connecting with so many other bloggers in person. There were so many unique people. By exchanging blog information, I found out about a lot (and I mean a lot) of other blogs. I thought I would share some of the blogs with you; hoping you'd find their blogs as fascinating as I had. Everyone was so sweet and inspirational. Check out their blogs! Go show them some support! Esha is a food photographer who specializes in incorporating different cultures into one dish. Her food photos will make your mouth water. You think I'm kidding, but I am seriously not. A recipe I am recommending for you to check out is her Indian-Asian Fusion Grilled Shrimp. Stacie is a beauty and fashion blogger who loves to make fashion easier for others. She loves to share her experiences in a fun voice. Since it's fall, I totally recommend that you read her 3 Fall Outfit Ideas for Anyone. Seriously simple hacks to keep warm and cute this fall! Valerie is a healthy lifestyle blogger. She specializes in delicious vegetarian dishes. If you're interested in maintaining a healthy lifestyle by choosing the vegetarian lifestyle, Valerie will do nothing but encourage you. 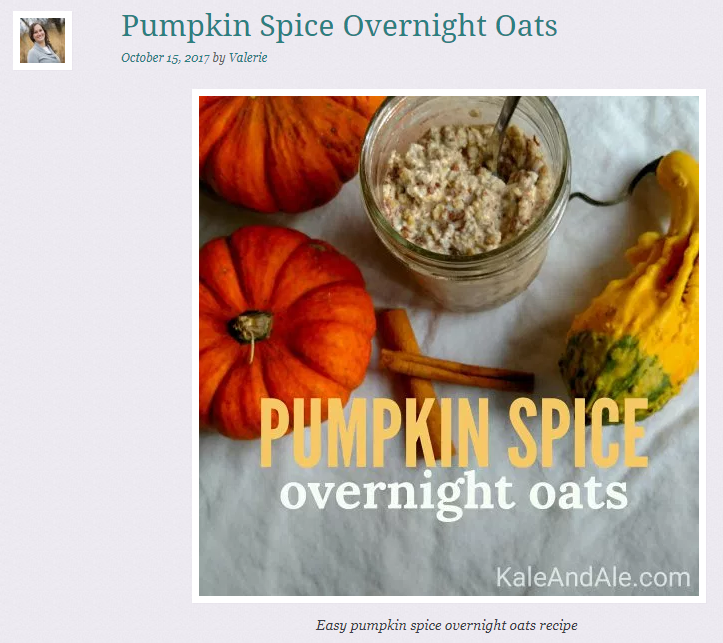 A fall festive recipe I love from her blog is Pumpkin Spice Overnight Oats. Can we take a moment to look at how yummy this looks! Molly is a newer travel and lifestyle blogger. She gives very thorough tips on travel as well as her recommendations for where to eat, sleep, and visit. If you're thinking of traveling to Paris--or just want to live vicariously though photos--you'll love her post: Paris? Oui, s'il vous plaît!